Most offices or commercial spaces in the country these days have central air conditioning, with ducts and vents running across the office, taking cold air to all parts. Such systems make sure that every corner of the office is uniformly cool. But during our recent visit to an office, we observed that a lot of cool air is being wasted in cooling areas that do not require cooling. Some of those areas were unoccupied spaces and some were plain store and inventory rooms. All this resulted in wastage of electricity in cooling areas that do not need cooling and higher electricity bills. So we thought of doing some research and found some solutions. It saves electricity cost: The compressor load is adjusted based on the heat load coming in from various indoor units by the invertor technology. Thus electricity consumption is less. To know more about inverter technology read our article: Air Conditioners with Inverter technology can help save electricity. 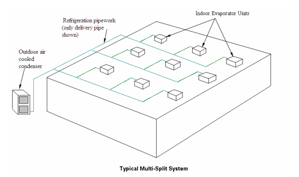 Using multi split system; one just has to make sure that the refrigerant tubing is not long so that there are energy losses during the refrigerant flow. Also a multi split system without inverter technology may not be very useful as the individual room control is not possible without inverter technology. Every room can have individual control and cooling of unoccupied areas can be avoided which will save electricity. Because of individual control, areas requiring lesser cooling can be kept at higher temperature thus saving electricity. It is important to note that although ducts and vents of central air conditioners can be closed to shut off air conditioning of a room, but that is not advisable as it can have adverse impact on the central air conditioning system. 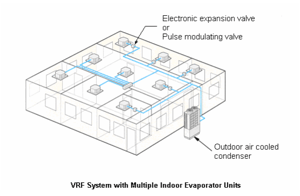 Using a VRF system is a better alternative.